Buckingham Schools: Homer Male Seminary | slate river ramblings . . . .
For many decades, Physic Springs in Buckingham County, near Gravel Hill, was a busy place. 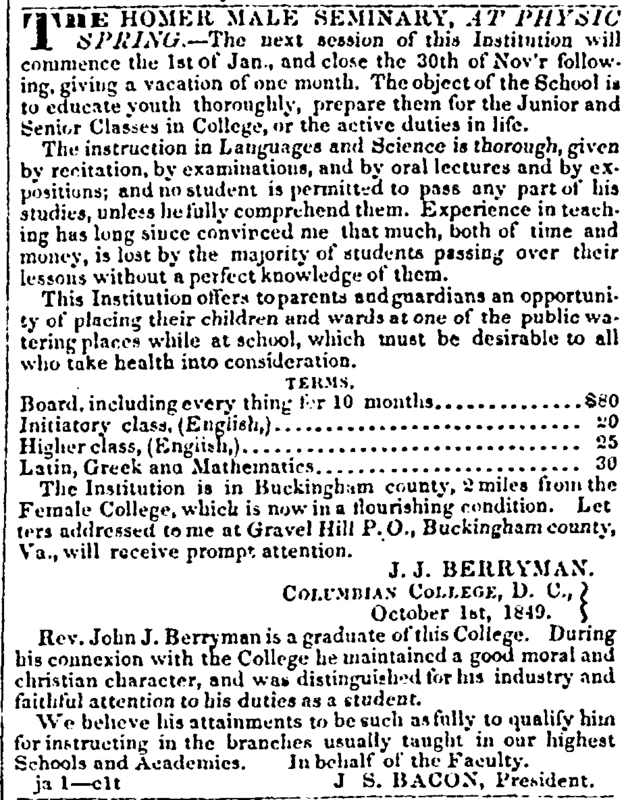 It was home to a health resort, a farm and mill, an Academy for boys, and a Seminary providing the equivalent of a junior college education. Instruction in Languages and Science was thorough. Boys did not advance who did not fully comprehend their course of study. Board for ten months was $80.00. Importantly, the institution was located just two miles from the Buckingham Female Collegiate Institute, facilitating fraternization between the young scholars and the girls of The Institute.